I am not usually a fan of mixed seed collections, call me an unadventurous coward if you must, but the lottery of colour and form is usually disappointing. 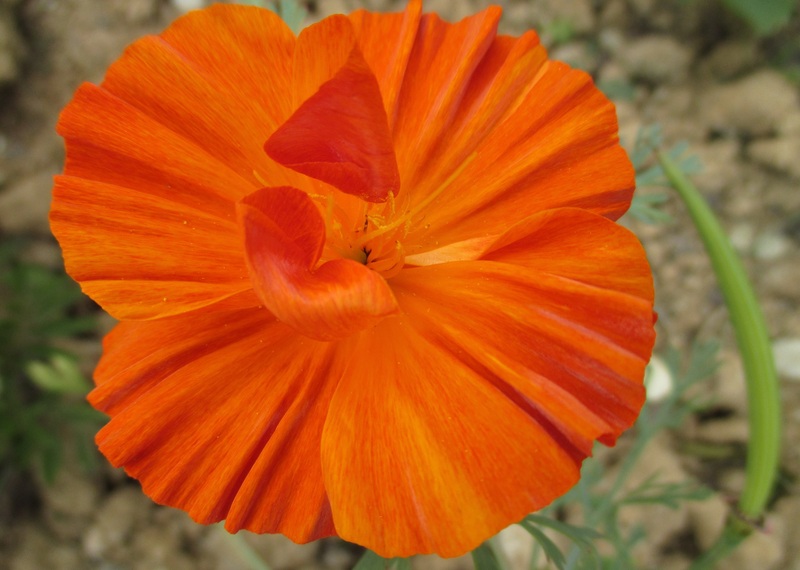 This californian poppy came from one such collection and it is the first of the bag that has caught my eye. The folds of the petals, ranging from burnt orange to deep yellow give depth and distinction to the flower. Almost corrugated, pleated with a natty central twist, just like the Issey Miyake dress I haven’t got. Just beautiful. Issey Miyake. That brings back memories. I bought one a long time ago in Paris (in a sale) on a whim. It has a classical work of art printed on the front of it (my description) or a Fallen Madonna with big boobies (Mikes’s description) and as such I am not allowed to wear it. Perhaps you should frame it and put it on the wall. I don’t think I would be able to carry one off, they are wonderful pieces of art! Crazy colour! Is it and Eschscholzia? California poppies are blooming now in the median strips of local highways. It’s a beautiful sight, as is your photograph. That sounds amazing, what a wonderful sight that must be!